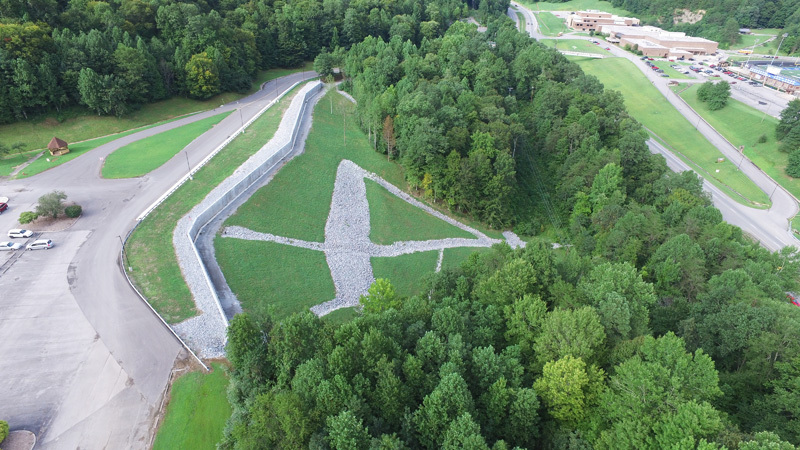 The Division of Abandoned Mine Lands, in the Department for Natural Resources (KYDNR), has been awarded a federal agency’s highest honor for its reclamation project that stabilized a serious landslide threat to a Middlesboro school. The Office of Surface Mining Reclamation and Enforcement (OSMRE) will present the award to the Division of Abandoned Mine Lands during a national gathering of mine land reclamation professionals in Lexington, KY in late September. OSMRE, through its Abandoned Mine Land (AML) Reclamation Program, addresses the hazards and environmental degradation created by the two centuries of U.S. coal mining that occurred before the signing of the Surface Mining Control and Reclamation Act of 1977. This will be OSMRE’s 25th year of honoring exemplary state and tribal reclamation projects. The Bell Central School HP AML Reclamation Project stabilized a serious landslide area that threatened the school access road and parking lot and was a significant health and safety threat to staff, students and parents. The school had made several attempts to begin construction work on the site, but was unable to carry out the project because of funding challenges. Section view of roadway that had to be torn out due unstable ground. Kentucky is home to one of the most pressing abandoned mine land reclamation tasks as a result of more than 200 years of coal mining. In fiscal year 2017, Kentucky received $33.5 million in AML reclamation funding from OSMRE. KYDNR was among five winners of the 2017 Abandoned Mine Land Reclamation Awards. Representatives from the Bell Central School and the Bell County Board of Education contacted the Kentucky Division of Abandoned Mine Lands in 2010 and reported a very serious landslide that had developed and was posing an imminent threat to the school access road and school parking lot. School officials expressed great concern that the school building and adjacent facilities might be damaged or destroyed if the slide should worsen and compromise the stability of the foundations. The school representatives described multiple, unsuccessful attempts by prior contractors to stabilize the slide and correct related problems. They also voiced concern that the failing school access road posed a serious safety threat to bus traffic and private vehicle traffic while traveling in and out of the school zone. “Our board had invested tens of thousands of dollars in architects and core drillings in an effort to determine how to even tackle the problem,” Bell County Schools Superintendent Yvonne Gilliam said in a letter to AML. “No one could come with a proposal to stop the movement of the slides that we could afford. Officials from DAML sent inspectors to the site and after numerous studies, dating from March of 2010 through June of 2014, DAML determined that the landslide, described above, was linked to eligible, underground mining drainage. Design engineers and other construction specialists with the Division of Abandoned Mine Lands developed a comprehensive plan of reclamation to eliminate the landslide, stabilize the area, establish effective drainage controls and restore the parking area and the school access road. The plan was endorsed and approved through the Federal Office of Surface Mining. At the close of the standard competitive bidding process, Jackson and Jackson, of Fall Rock, KY was awarded the $2.1 million contract. Work began on August 20, 2014 and concluded on August 10, 2015. The project included the construction of a 650 foot, reinforced concrete retaining wall that is 10 feet high and secured to a reinforced concrete foundation. The foundation was reinforced with concrete pilings that ranged from 35 to 50 feet deep and extended an average of 10 feet into bedrock. Pre-construction photo facing south. Slide damage to the school access road, sidewalk and guardrail is clearly evident. North end of the wall with some Class II backfill rock in place. This was part of the process to successfully build a stable roadway for the school. Jackson and Jackson built three drains into the retaining wall to control and route sub-surface drainage passing underneath the school property. The company also built two surface drains to route drainage from the school parking area. In addition, three “2×4 V Cap” concrete structures were built to enhance the stability of the school property these structures were anchored into solid rock via steel reinforced, concrete pilings. Most of the excavated slide material below the wall was considered unusable as permanent backfill above the wall as it was heavily saturated. It was trucked to an approved waste area. About 4,375 cubic yards of high quality topsoil was located at and removed from the Bell County High School football field, which was being renovated by Earthmovers Inc.
Earthmovers Inc. stepped up in a large way to assist the AML contractor with trucks and drivers to transport a significant portion of the soil, at no cost to the Jackson and Jackson contractors. All the disturbed soil was limed, fertilized, seeded and mulched. And after two growing seasons, the grass is dense and healthy. Groundskeepers for the school periodically mow and trim the reclaimed acreage above and below the wall. Photos provided by the Division of Abandoned Mine Lands.